Despite briefly looking like it might have a green light, an animated film based on the Terminator movies has been stymied by legal wrangling. On Friday, Hannover House and Red Bear Entertainment announced that they were making Terminator 3000, a PG-13 rated, 3D-animated movie with a budget of $70 million. 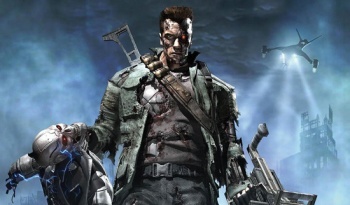 But now a big question mark has been drawn over the project, as the studios have been served with a cease and desist notice, saying that they don't have the rights to the Terminator franchise. The current rights holder for the Terminator franchise is a hedge fund called Pacificor LLC, which picked them up at auction last February after the previous holder, a company called Halcyon, went bankrupt. But according to Hannover House CEO Eric Parkinson, the animation rights for the series rest with him, as they were excluded from the deal when original studio Hemdale sold the rights to Carolco in the 90s, and were later given to Parkinson as part of his severance package with Hemdale. Parkinson admits however, that he isn't sure whether he'll be able to go ahead without Pacificor's help, as the way the contracts are written means that it would be "dangerous" to try to make the movie alone. "The best way to put it is," he said. "They can't make an animated film without me, and we might not be able to make it without them. We are in discussions with WME [the agency repping the Terminator film rights] and hope we can deal with this expeditiously." What's strange about this situation is that it happened at all, as you'd think that someone at Hannover House would have checked these details before making the announcement. With the rights split like this, you'd assume it would have been one of the first things that Hannover House would have checked, especially as Parkinson seems quite well versed on it. Terminator 3000 was supposed to start production in January, but we'll have to wait and see whether that schedule can be adhered to in the face of this new legal challenge.